It gives us great pleasure to invite you to the final ceremony of the Vodafone Crossword Book Award 2009 that celebrates & rewards the best literary works of the year. Shortlisted authors Amit Chaudhuri, Arunava Sinha, Biman Nath, Gurcharan Das, Kalpana Swaminathan, Maitreyee S. C., Mridula Koshy, Nonica Datta, Rajni Bakshi, Roopa Pai, Salma, Sarah Joseph, Shreekumar Varma, Siddhartha Sarma, Sunanda K. Datta Ray, S. M. M. Ausaja …& Valson Thampu will be attending the final awards ceremony. 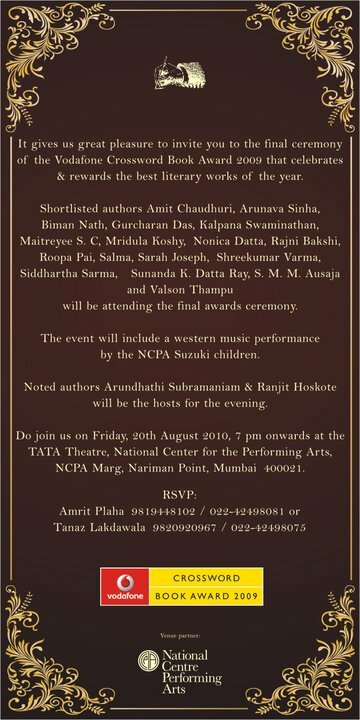 The event will include a violin performance by young children trained under the NCPA Suzuki Initiative. Arundhathi Subramaniam & Ranjit Hoskote will be the hosts for the evening. Limited passes available. For passes, write to us at crosswordconnect@crossword.co.in or call 022-42498081 / 022-42498075 / 022-42498078.